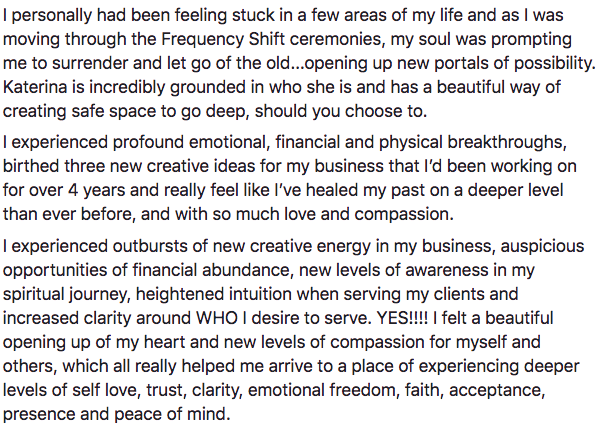 You are invited to join the Frequency Shift™ – a proven process for releasing energetic blocks, UPGRADING your aura, and unleashing your unique genius. Imagine what it would be like to feel clarity, enthusiasm and Soul purpose coursing through your veins? What if you brightened up EVERY room you stepped into? Believe it or not, this BARELY scratches the surface of what’s possible through the Frequency Shift™ journey. Hi, I am Katerina Satori, and I created this course to help people just like you to discover the heart’s infinite wisdom, remember the Soul’s divine purpose, and activate the body’s intuitive capacity for always moving in the right direction. Bonus goodies that you will love! You will receive access to my member's area where this course will be waiting for you. You can access this course from anywhere in the world and it's optimized for your smartphone...study and shift your frequency wherever you are. P.S. See below what my graduates say about their experience with this course. and you being supported in the deepest way through the entire process!